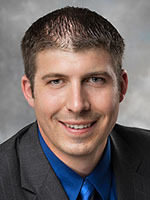 Dr. Etter earned his medical degree from the University of New England College of Osteopathic Medicine in Biddeford, Maine, and completed his Family Medicine residency at Kent County Hospital in Warwick, RI. Dr. Etter is board certified by the American College of Osteopathic Family Physicians in both Family Medicine and Osteopathic Manipulative Medicine. He has special interests in pediatrics, adolescent medicine, sports medicine, and osteopathic manipulative medicine—hands-on techniques used to maximize patient’s function and relieve pain with little or no medication.